Action Chinese Chess is the best Chinese Chess board game, aka Co Tuong or Xiangqi in the market with amazing graphics, smart computer and awesome features. ♥ Classic: play offline with 10 difficulty levels of Computer, from beginner to expert. ♥ Solve Puzzles: hundreds of fun Puzzles await to be solved, the best way to learn Co Tuong. ♥ 2 Players: play-and-pass directly with friends on the same device. ♥ World Tournament: play online with friends and other players all around the world. ♥ Vietnamese Mystery Chess (Cờ Tướng Úp), aka Co Tuong Up or Co Up. ♥ Taiwanese Dark Chess (暗棋), aka Blind Chess (盲棋), Half Chess (半棋) or Banqi. 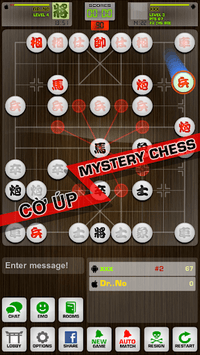 ♥ Teach you to play Chinese Chess with Endgame Puzzles, Tactics and Hints. 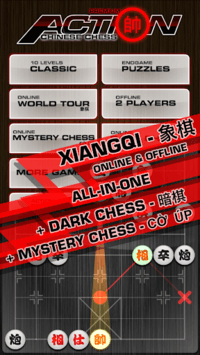 ♥ Multiple Skins and with either Chinese or Western Chess Symbols. ♥ Brilliant interactive User Interface, beautiful graphics and animations. ♥ Ability to show possible moves, unlimitedly Unmove. ♥ Ability to invite friends, share your games via Facebook, Twitter, Sina Weibo. ♥ Google Game Leaderboards and Achievements. Chinese Chess is also known as Xiangqi, Xiàng Qí, 中国象棋, シャンチー, Cờ Tướng, Co Tuong, Cotuong, Asian Chess, Janggi. 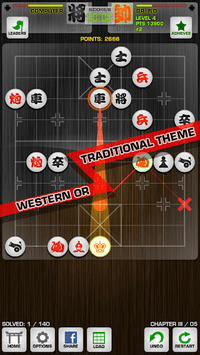 This game is also designed for Chess, Checker and Mahjong players; you don't need to read Chinese characters, the game can show you the equivalent chess symbols.